Making bicyclists of all ages feel more secure in city traffic is a top goal of the city of Seattle, which will soon release the final draft of its Bicycle Master Plan for public comment. At the heart of the 10-year strategy is a call to designate more than 200 miles of roadway as bike lanes, along with guidelines for safely sharing roads and trails with cars and pedestrians. While the city currently offers only 25 miles of designated bike lanes, the plan anticipates a huge increase in recreational and commuting bicyclists. What excites Wayne Wentz, the city's director of traffic management, is that the plan was mandated by the people--as part of a $360 million property tax levy passed last fall--which means it comes with the funding to make it happen. This is a great article from a couple days ago. 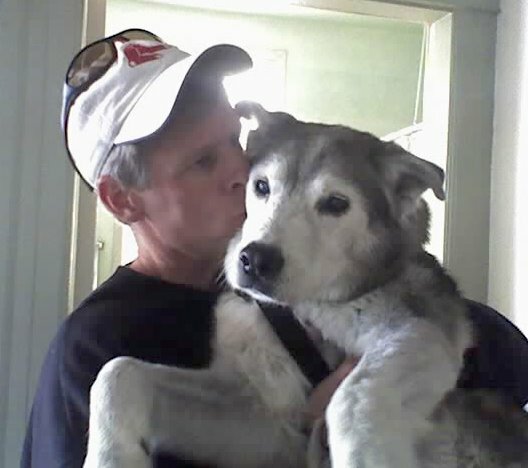 (I've been negligent in my blogging; the approach of April means tax preparation at home, budget preparation at work, and the opening of baseball season.) 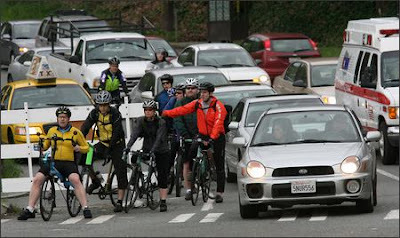 Among the great points the article makes is the improved safety for bicyclists as the number of pedalers increases; and it credits the Cascade Cycling Club for its efforts to promote safe conduct by motorists and bicyclists. Image: Mike Urban/Seattle Post-Intelligencer. Cyclists in Seattle, Washington. At Christmas, the UK arm of Ikea gifted all 9000 staffers with free folding bikes, sourced by Raleigh UK from a factory in Eastern Europe. One wonders when Google--purportedly supportive of bike commuting--will provide a similar bike perk to its employees in the U.S. I don't think the primary obstacle to bike commuting is lack of bicycles. A primary challenge is the way employers in the U.S. encourage their staff to drive, by locating facilities in sprawling office parks far from transit and absorbing the cost of providing free parking. (Parking costs include land, construction, maintenance, security, and lighting.) It's amazing--and sad--that these same employers often vigorously resist creating bicyclist-supporting facilities (bike racks, showers, lockers, etc.) 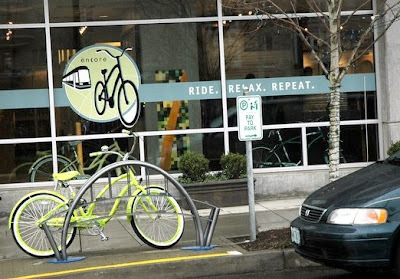 One automobile space could be converted to create parking for 10-12 bicycles. Bike promotion activities by major employers such as Google could greatly help foster a more bicyclist-friendly U.S. The benefits to employers of increased bike commuting are many, including reduced medical costs, improved employee health, reduced absenteeism, improved productivity, and reduced parking costs. 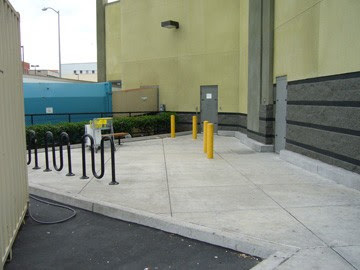 Employee demand for enhanced bike facilities at work can often yield results. I encourage you to raise the issue with your employer. If you have a supportive employer, I'd like to hear about it. Where's the bike rack (retail)? However, many of these same communities overlook bike parking. Bike racks lack the visibility of other facilities, where politicians and bureaucrats can smile for ribbon-cutting photo ops. The news cameras turn out when the mayor dons a helmet and joins the annual Bike to Work Day. But the media pays no attention to the DPW employee installing a rack. And then there are commercial enterprises who believe: Motorists equals trunk space equals major cash register action. Hence, they provide ample vehicle parking, and, if they bother to consider bicyclists at all, their parking is often poorly installed, ineffective, or hidden. This is the surely the case with the bike rack pictured here, at the Best Buy store in San Francisco's Mission district. Best Buy provides about an acre of car parking--not in sprawling Houston, mind, but in densely populated and transit rich San Francisco!--and locates its bike rack on the remote side of the building near the dumpster. And this Best Buy outlet is very close to some of San Francisco's most notorious chop shops. Any wonder this bike rack is unused? Many recreational bicyclists might considering commuting and shopping by bike if they were assured of a secure parking space. They aren't going to leave their $2,000 titanium road bike locked to a pole in a dark alley. Secure bike parking is a critical factor in the attractiveness of bike commuting. Around the country, forward-looking public officials are working like mad to make their cities and states bike-friendly. In Chicago, Mayor Richard Daley is building hundreds of miles of bike trails. From Washington, D.C., to Washington state, officials are promoting biking. But alas, not in Connecticut. 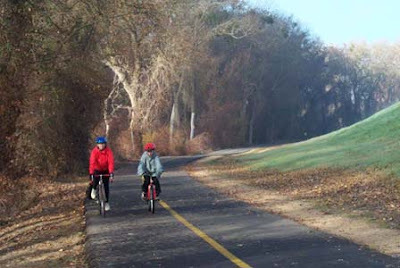 This is a positive editorial from Connecticut's leading daily newspaper, in support of a bill to provide funding to complete the state's section of the East Coast Greenway, an off-road trail being built from Maine to Florida. Image: Ted Bowman. 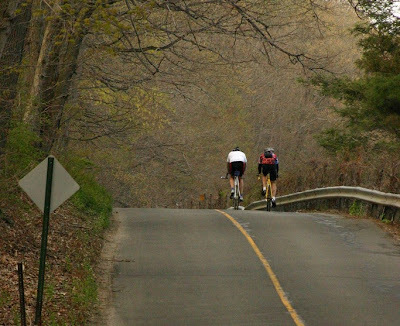 Bicyclists in Connecticut. 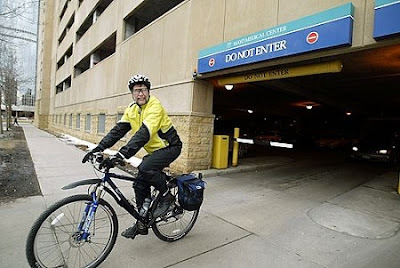 Paul Anderson, a Mayo Clinic computer programmer, is a two-wheeled commuter. He rides his bike to work year-round. "I do have my limits," said Anderson, 60. "If it's below zero, I don't do that. Too cold. And usually not the day after it snows." The start of spring heralds a season when thousands of others, like Anderson, can confidently brave the elements almost every day for their commute. An estimated 5 percent of Rochester (Minnesota) workers walk or pedal to their jobs. This is a optimistic, positive article from chilly Minnesota. 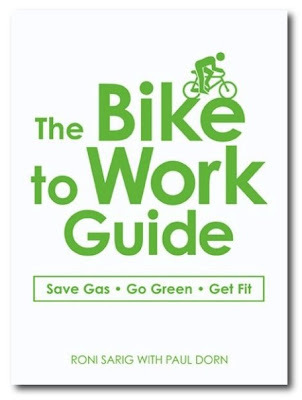 It considers the challenges, motivations, and satisfactions of everyday bike commuters, and thankfully doesn't give voice to motoring objectors. And it conveys the optimism of the community's bicyclists for future progress. Image: Post-Bulletin (Rochester, MN). 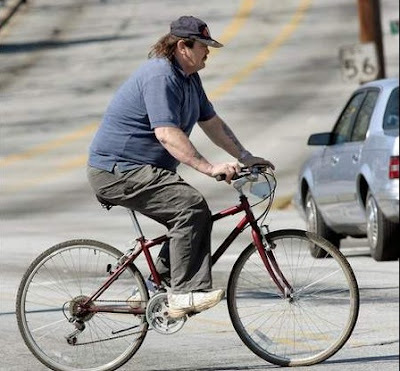 Bike commuter Paul Anderson. Last week, Rep. Earl Blumenauer (D-Ore.) braved a cold, rainy day to zoom around Capitol Hill on his Trek bike--appropriately, the Portland commuting model--to celebrate the National Bike Summit hosted by the CBC. As for the majority of the caucuses that focus on a single issue, many health-related, Smith said their work probably helps keep some legislative efforts alive. They can, he said, "make a difference at the margins." The bike caucus, for example, promotes funding for cycling activities. It introduced the Bike Commuter Act to give transit benefits to bicycle commuters and establish a federal safe-routes-to-school program. Sigh. Bicyclists in the U.S. have spent most of the past two decades organizing as a political constituency, and the only way the beltway pundits can acknowledge us is as a wacky special interest. 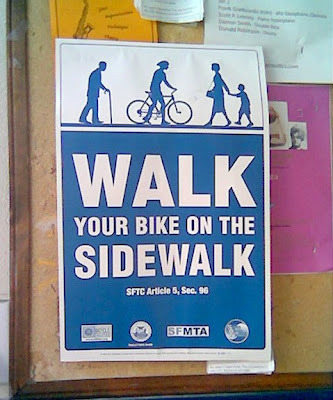 I date the new paradigm of bicycle advocacy to the pivotal passage of ISTEA in 1991, which for the first time made federal transportation money available for bike and pedestrian facilities. Prior to ISTEA, bike advocacy was more pessimistic about the possibility of changing the streetscape, and bicyclists pursued adaptive "bike education" approaches. Sadly, many of these "old paradigm" bike advocates continue to push a narrowly defined approach to education. The 2007 National Bike Summit attracted a record 430 advocates, and the primary announcement was the aforementioned reintroduction of the Bicycle Commuter Act. Eventually, we two-wheeled pedaling types will be recognized as legitimate commuters, and the BTA or something like it will succeed. However, it's hard to imagine this petroleum-soaked Bush administration actually signing the BTA. But we can always hope. I'm more optimistic about the possibility of cycling improvements at the local and state level. The strong turnout at the National Bike Summit is indicative of the grassroots growth of our movement. (Or is it a cause?) We're making progress. At least the beltway pundits are noticing, even if they feel compelled to be dismissive. At least we aren't ignored anymore. Image: BikePortland.org. 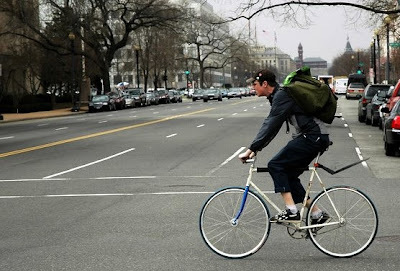 Cyclist in Washington D.C. 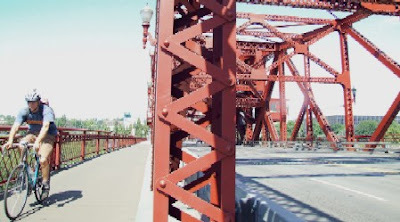 Opening the stretch (of Sacramento River shoreline) through the Pocket area would finally make it possible for families to ride bicycles from anywhere on the city's west side to Old Sacramento and River Cats games, even all the way to Folsom by connecting to the American River Parkway. It is also a key gateway to the newly adopted California Delta Trail. The huge public turnout and show of support for the recent Amgen Tour of California bicycle race confirmed that this is indeed a bicycle town. Last year, the city earned a bronze medal from the League of American Bicyclists for its efforts to promote bicycle riding and commuting. Together, we can--and should--go for the gold. This trail could become a heavily used commute route and a significant, enjoyable recreation path. Think of the benefits: energy conservation, air quality improvements and a reduction in traffic congestion. The public is ready to take action on the environmental issues of the day, but they need the leaders to provide practical tools for making progress. Tom Higgins was the founding president of the California Bicycle Coalition, which I had the privilege to lead--or tried to lead--as executive director for a short year. Higgins continues to be a cycling enthusiast and advocate, working as a legislative aide to pro-bicycling California State Senator Tom Torlakson. Recreational bike trails, such as the Sacramento River trail proposed by this persuasive op-ed, often become important commute corridors for biyclists. We enthusiastically support this proposal. Signs like these have popped up in San Francisco, ever since some "fist-shaking" senior citizens started campaigning against bicyclists. Good for them. Many beginning cyclists think that riding on the sidewalk is safer than riding in the street. They couldn't be more wrong. Cycling on the sidewalk means you have to dodge pedestrians, pets, scaffolding, garbage cans, parking meters and signs, vehicles exiting driveways and garages, landscaping, trees and leafy debris, motorists turning off the street, pedestrians leaving buildings without expecting a high velocity traveler sharing their space, and police officers with a ticket quota to meet. Senior citizens and pedestrians are also oppressed by motorists. They should be allies of bicyclists, not enemies. When they see bicyclists organized as an effective political force against threatening traffic, they will join in our efforts against the automotive scourge. In the meantime, stay off the sidewalks. Within Davis, the campus of the University of California attracts even more bikes. All college campuses are teeming with them, but Davis is in another league. 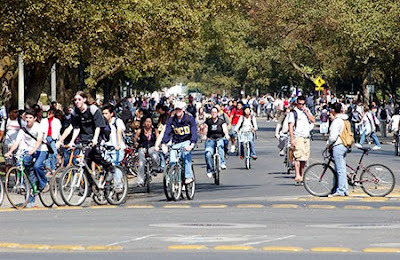 With the core of campus off limits to most cars, the roads have become a two-wheeled version of a California freeway, with hundreds of students dodging one another around traffic circles. When you repair 10,000 bikes a year, you see some crazy ones. One guy regularly brings his bike in with broken spokes and busted rear wheels. The problem, Mr. (UC Davis Bike Barn manager Robert)St. Cyr tells him, may be the garden that he grows on the rear rack. He carries 150 pounds of dirt and geraniums around the campus. But mostly the shop deals with cheap department-store bikes. "You pay $50 for one from K-B Toys or Wal-Mart, and then instantly, the bike falls apart," Mr. St. Cyr says. And then he corrects himself. He shouldn't call them bikes: "Really it's an imitation bicycle." Here's a surprising thing about the university in Bike City USA. "It's the scariest place I've ever ridden," says Mr. St. Cyr. "You can ride through gangster neighborhoods, and it's safer than riding through here," he says. 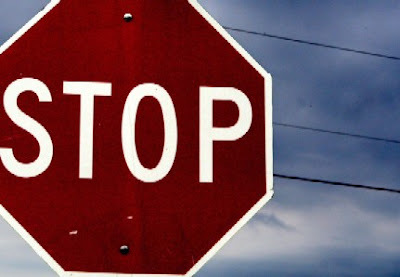 "Students will obey basic traffic signs off campus, but the minute you get on campus, it's just lawlessness. That's how you survive. That's how you get around on campus and you realize that no one behaves in a predictable manner. The pedestrians don't look when they cross the street. The cyclists just ride wherever they want to ride, and no one pays attention." I've provided extensive excerpts from this article, as it requires a Chronicle of Higher Education subscription to read the online archive. These are the primary points: that university students waste too much money on junky bikes; and that lacking much experience operating a bicycle, these students needlessly endanger themselves. I'm an admitted enthusiast for "Bike City USA" Davis, California--where I am now employed at the University of California, Davis. With its high mode share for bicycling, the city has become a laboratory for traffic engineering for two-wheeled transportation. As the article indicates, there are challenges remaining to be sure. These shortcomings were the topic of a recent presentation on the city's bicycling history. As the weather warms up and spring nears, you can expect to see more bicycles on the roads. While some bicyclists...ride in harmony with motorists, there are others who say there is friction between drivers and bikers. Some cyclists say drivers go too fast around them or don't give them enough room. On the other hand, some drivers accuse bicyclists of taking up too much space, not paying attention to traffic around them and disobeying traffic laws. The most disappointing element of this article was the fact the writer had to contact the Washington, D.C.-based League of American Bicyclists for a comment. Apparently, the local bike advocates aren't yet equipped to effectively position a media message about bicycling. In the absence of effective advocacy, the best bicyclists in Iowa City seem able to muster at present is a lame, "can't we all just get along?" As I've commented earlier, bicyclists don't get respect by behaving better than motorized travelers. Accustomed to a privileged position on public thoroughfares, many motorists simply regard bicyclists as ill-mannered children, refusing to accord adequate respect as equals on the road. They refuse to see us as grown-ups, deserving of respect. Organizing as a political consitutency--not polite behavior--is the only way to earn respect. Fullerton, CA, March 10, 2007--(PR.COM)--Founders of a very popular mountain biking website have launched two new sites, BikeCommuters.com and CiclistaFanatico.com. Moises Ramirez and RL Policar have launched these new sites to cater to bicycle commuters and the Spanish speaking bicyclist. Welcome to the new kids on the block. It's certainly true that the bicycle industry is seeing more opportunity with the commuter market. However, with the exception of a few companies such at Breezer Bikes, the industry continues to prioritize the market for recreational and sport cycling. Today's tough adjustment was the lost hour from the advanced Daylight Savings Time. Of course, DST is a hopeful signal of warmer weather and longer days. And for bike commuters, DST also means more sun. Life spans in general are increasing, and healthy activities like bike commuting can help you maintain your health for even more years. You certainly want your skin to last as long as you do, and you should prudently protect it. That means sunscreen. 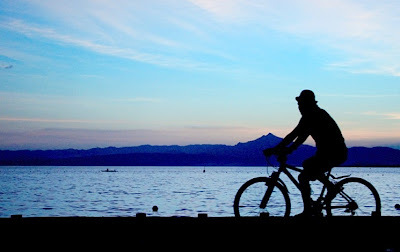 If your bicycling is 30 minutes or less in the early morning and late afternoon, you may be fine without sunscreen. However, if you spend significant time outdoors during the high-sun periods in the middle of the day, you will definitely want to apply sunscreen. The higher the SPF the better. 2) Don't apply sunscreen to your forehead, as perspiration will wash it into your eyes. That ain't fun. Your helmet should provide adequate cover, or you might consider wearing a bandana. Long sleeves keeps the sun off, and puckery seersucker doesn’t lay on your skin. A loose shirt flaps to cool you. The high collar protects neck, too, and can be turned up for Gobi-desert riding. Hooray for the approach of spring. There are thousands of ways to be sustainable, which makes sustainability not only the right and smart thing to do but also fun. Certainly, one of the most fun ways is riding a bike. "If we would all bike to work, that would be the biggest thing for our planet," said Michelle Poyourow, events coordinator for the (Bicycle Transportation Alliance). "That would be the easiest way to make a difference." This a refreshing article, especially on a day when the front page of California's newspapers agonize over rapidly rising gas prices now topping $3 a gallon. There are many great reasons to commute by bicycle--financial, environmental, health, and time-saving--and this article hits on all the reasons. Another great article in the same motivational vein appeared online today in the Houstonist. And I'm grateful for the mention of my modest Bike Commuting Tips website. Ah Boston, city of my youth, home to my beloved American League baseball franchise (opening game is just 24 days away!) Even in Beantown, location of the most expensive highway project in U.S. history, bicycle commuters are in the mainstream media. The Boston Herald no less. Maybe the bike movement is making progress. Every person who chooses to walk or ride to a destination also takes one vehicle off the road. Alone, they don't make much difference. En masse, they ease congestion, reduce air pollution and burn less fossil fuel. They help create a less hectic, cleaner city. Most important, though, is that bike and pedestrian facilities are community amenities. This is a surprisingly enlightened editorial from a mainstream publication. The writer gets it. Improved bicycling conditions are good things not just for bicyclists, but for the entire community and its economic vitality. (The) federal government is prepared to spend ($7.3 million) this year on encouraging more Minneapolis-area residents to use nonmotorized transportation. The program has already announced plans to pay for 1,000 new bike racks at schools, recreation centers and transit stops throughout the city, and it’s also funding the development of a pedestrian plan. Larry Bontreger, 53, wore a maroon and white Golden Gophers jacket as he wrapped a chain around his yellow bike along 4th Street. The city might encourage more ridership by improving the flow of bike lanes in the city, he said. It’s inconvenient when lanes or trails end abruptly without connecting to other routes, he said. Exactly. This is precisely the issue for those motoring pundits who seek to privilege drivers--in their view bikes simply don't belong. Bicyclists are tolerated, only on the condition that they behave better than any other class of road users to earn respect. Of course, like many bicyclists, I can attest that vehicle code compliance is no, repeat no guarantee of safe passage on city streets. The pervasive idea that motorists have a greater "right" to public thoroughfares--while bicyclists are barely tolerated intruders--is a great challenge to a more equitable transportation system. Effective advocacy that consistently challenges such nonsense is critical. Visit: Bicycling is about to get a whole lot better in the city of Minneapolis, Minneapolis Star-Tribune. Spartanburg is on the cusp of gaining full "Bicycle Friendly Community" status from the League of American Bicyclists. Last year, the community received an honorable mention in its quest for the designation that's only been awarded to 60 communities, of the more than 140 communities that applied nationwide. Watch out Davis, California. Spartanburg is coming after you. The League of American Bicyclists' Bicycle Friendly Community program has succeeded in motivating cities around the country to pursue needed improvements in bicycling infrastructure. Impressive. The City of Roses is truly setting the standard for bicycling promotion by major cities. For the most part, bicyclists who ride for recreation do follow the law, traveling with the flow of traffic and abiding by rules. But if all bicyclists are going to get the respect they deserve--since they don't pack quite the heft of a car or truck--it is incumbent on all two-wheeling folks to follow the rules. We can't count the number of times we've seen a bicyclist, usually one not wearing a helmet or any safety gear, blatantly run a red light or stop sign while all other motorists sat there in shock. I've already expressed my exasperation with this sort of tiresome "friendly" advice to bicyclists, suggesting that respect is contingent on group behavior. If respect on the roads were earned by universal compliance by a class of users, then motorists--who, after all, kill more than 40,000 people every year in the U.S.--would be the first group banned from public thoroughfares. Bicyclists earn respect when they organize as a political constituency, forming advocacy groups that ally with other environmentalists, pedestrians, safety activists, clean air proponents (Lung Association, etc. ), community organizations, preservationists, and others into coalitions challenging the pervasive hegemony of the motoring menace. Rights and respect aren't gained by "playing nice." Respect is earned by organized political power.